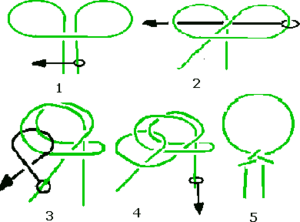 The Irish bowline is a loop knot. as are all bowlines, the difference is the untying of the knot, non-jamming, and when the bow is tied in a line. First tie a cow hitch then cross the end over the standing part to form a pretzel. Second step viewing the knot from the side move the end under the knot to the back then through the middle of the cow hitch to the front. The third step is to tuck the end into the loop forming a half-hitch. Dress the knot by pulling on all sides evenly. First make a loop and then thread the rope through the object. passing the rope through the loop toward the back. Around the front passing the knot through the same loop in the opposite direction. This creates a second loop in the center of the knot. Thread the rope into the second loop pulling all sides evenly. pull both ends apart at the same time. This page was last edited on 31 August 2010, at 07:35.